I am not sure if it is the weather or my schedule of late but I havent really spent my usual amount of time planning the garden for this year. I was letting the dog out the side door just yesterday (Monday – i’m writing this one early as I am away this weekend) and noticed my asparagus was already 3 feet tall UGH! I hadn’t even cleaned out the debris from last year. I immediately went out and dealt with the situation and had some of the “normal” sized stalks for dinner – they were delicious as I knew they would be . Last year my zucchini was such a disappointment i am hoping for better this season. I realize people tend to use the oops I didn’t get to the garden in time sized squash that went from perfect to damn how did I miss that one; it’s the size of a Softball bat. For when they want to make zucchini lasagna; even though most times they are very seedy. But if you are looking for something to make with the cute little ones, this will fit the bill. Plus they are super cute and really easy to make. I actually have been trying for a month or so to make these. It started when I saw the crop of squash at the store, they were so cute so I grabbed a bag full. I forgot to go back to the other end of the store for the ricotta – fail. Then the next trip I grabbed some ricotta and thought I had some squash at home – fail. Finally I was going to make it happen – nope another fail timing is everything and it got away from me. Now I was determined and finally pulled it off. They don’t take long at all but I definitely could have used a few more to fill the pan I chose to make it in. I know just use a smaller dish – I know I know I have issues! Regardless I was very happy I finally made it happen, they are tasty, easy to assemble, quick and worth the wait. Either make your marinara or use your favorite jarred sauce and doctor it up as you normally would, or not. In a medium bowl combine the ricotta, eggs, parsley, parmesan, mozzarella, salt and pepper. Mix till combined. Using your vegetable peeler, slice lengthwise till you can’t anymore. I didn’t do this but think it would be easier to leave the stem on to use as a handle. Depending how large you want your ravioli layer 2 slices side by side then top with two more slices going the opposite direction. Put a dollop of the cheese mixture in the center and fold into a little package. Layer as you would a lasagna. Sauce, ravioli, cheese and repeat. My garden has been pretty good to me this year with plenty of cucumbers, summer squash and zucchini. I really don’t want to talk about my non-existent eggplant or beefsteak tomatoes. Thankfully my cherry and roma tomato plants are picking up a little of the slack; and it also helps my husband has found a way to add tomato to his sandwich that he thinks works out pretty slick; he takes a bite of sandwich and pops a cherry tomato in his mouth and he likes that his sandwich stays dry. I say win win! Now how to get a win with someone who doesn’t like zucchini; which I can actually relate to; when I was growing up; besides my aversion to everything green; the only way I had zucchini and summer squash was steamed or boiled to death. I was reminded of this when I was talking with my dad last week about how I prepare versus how he prepares squash. I like mine on the al dente side and he likes his well on the mush side. No thank you! Before this I had only made hasselback potatoes, never even thought about another vegetable before but why not? Make crosswise cuts every ½ inch along each zucchini. Make sure to slice almost to the bottom of the squash but not all the way through. I use a round handle of a wooden spoon to help me get the same size cuts. Gently fan the squash to make them a little wider. Place a shaved piece of Parmesan in each of the cuts and then brush the oil mixture over the top. Place the squash on a double layer of foil and grill (without turning) until browned and tender about 15 minutes. If there were an Olympic event for harvesting the most cucumbers from just a few plants or growing the largest cabbage in a raised bed or even who can find and pick the best shaped squash; I think we could be in the running. Despite the drought and thanking my personal “water boy” my gardens are looking pretty damn good! look how adorable my butternut squash are!!! Now comes the task of what to do with everything. Yesterday I spent the day baking zucchini bread that will last probably till next year, I actually did have to rotate last years bread to the front. I have also been kind of obsessed with fried Parmesan zucchini chips. I think I have made them at least 3 times in the last month; I also made a couple of zucchini hasselback packets for out on the grill. Last night I decided to use up some items I had in the fridge. When I was going through my freezer I noticed a container of last years processed tomatoes that I made into a nice Italian sausage marinara sauce, and there was a small container of ricotta cheese and yes many squashes to choose from. The ingredients screamed zucchini boats; ya don’t ask me why that is what they said but I personally think it was because I didn’t want to make a full fledged lasagna out of them so I took the easy way out. Using a spoon scoop out the flesh making sure to leave enough to hold the cheese and sauce. Fill the zucchini with the ricotta mixture then cover with marinara sauce. Cover with mozzarella and bake at 350’F for 30-45 minutes. In a large bowl, combine Panko and Parmesan; set aside. Working in batches, dredge zucchini rounds in flour, dip into eggs, then dredge in Panko mixture, pressing to coat. Add zucchini rounds to the skillet, 5 or 6 at a time, and cook until evenly golden and crispy, about 1 minute on each side. Transfer to a paper towel-lined plate. I had a wonderful visit from a lifelong friend this weekend. We met when we were around 11 maybe and even though we do not see or talk with each other often; you know life and miles get in the way; it is like we see each other all the time. We pick right up where we left off from our last visit. 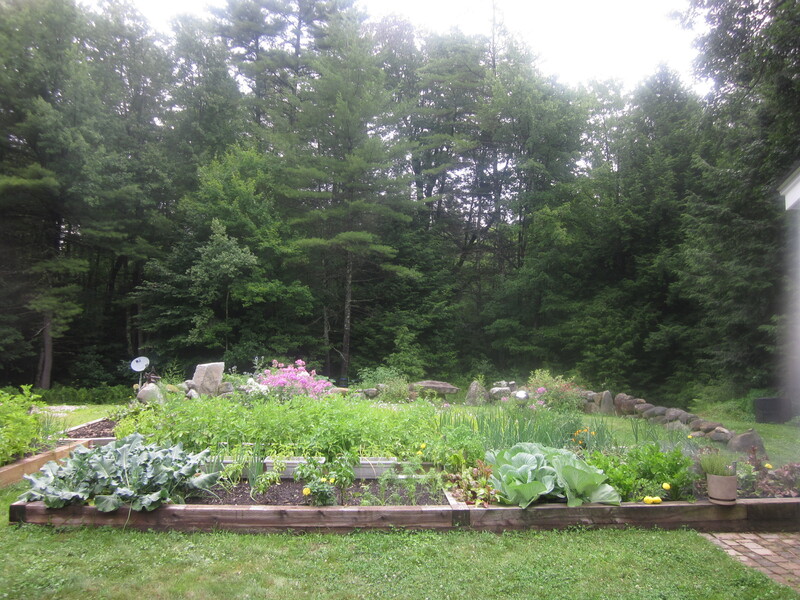 We spent time going through my garden; she and her boyfriend are new to vegetable gardening. We talked plants and what was working and what wasn’t. They had the dreaded vine borers that I had been plagued with the last few years, this year we did not have that problem thankfully. We have had an abundance of zucchini which inspired tonight’s dinner. I just finished making stuffed zucchini; which I have had and never made before. While baking is a science and you really need to pay attention to the ingredients and the amounts needed. Cooking is the complete opposite. I tend to use the ingredients I like and have on hand. Stuffing being pretty basic formula; herbs, bread crumbs, a little heat and lots of flavor plus I am a HUGE sausage fan so that is a must. While I was chopping and sauteing I sent my husband to the garden for some herbs. I asked for parsley and whatever else he would like. He came back with thyme, basil and parsley. Even though I did spend a little time looking online for some ideas in the end I used what I had on hand and made a stuffing that tasted really good. I can only imagine once the sauce and mozzarella meld with the squash and stuffing it will taste pretty amazing. I will let you know in about an hour. They were delicious – my husband and I both agree to make them again. Jalapeno – I removed the seeds with a spoon – we like a little heat. Here is how I made mine – shallot, onion, zucchini, garlic and the herbs were from my garden – I think that is SO cool! Wash and remove the stem and bottom of the zucchini, in a bowl add all the other ingredients and herbs; stir and let meld for a bit. Preheat the oven at 350’ get out a baking dish. Fill the zucchini with the yummy stuffing and cover with the sauce and mozzarella. Cover with tin foil for 40 minutes then uncover and cook another 20 or so till bubbly and browned we do like our squash al dente versus mush so please cook to your likeness – if you need to place under the broiler for a few minutes please do. I think food tastes better when it looks amazing – the company helps with this too. 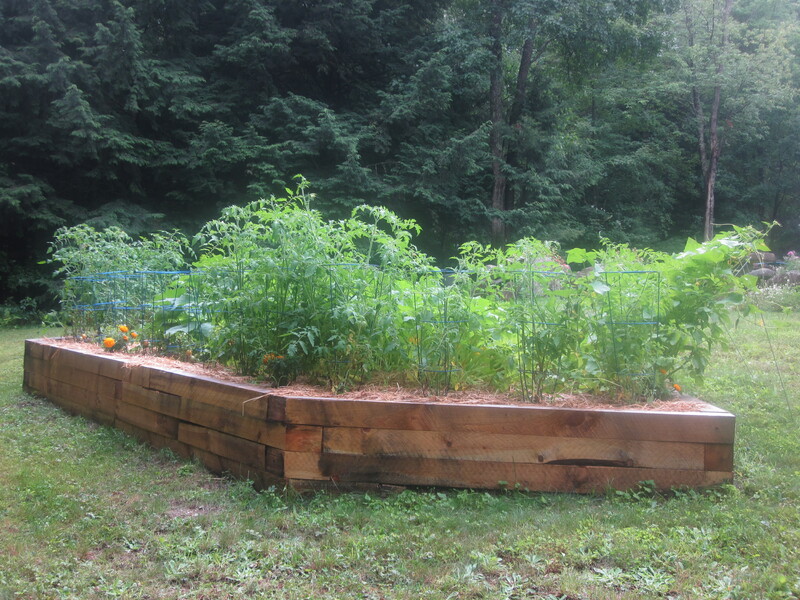 Zucchini, Summer Squash, Cucumbers, Tomatoes and Butternut Squash all looking good! 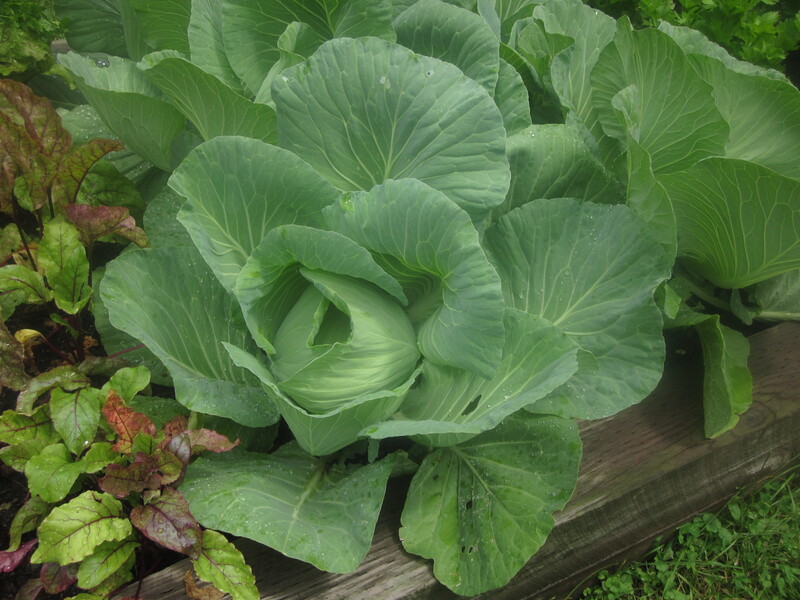 Our gardens are doing really well this year for the most part. The only disappointments are my peppers, both the bell and jalapeno’ peppers are just not growing or producing. 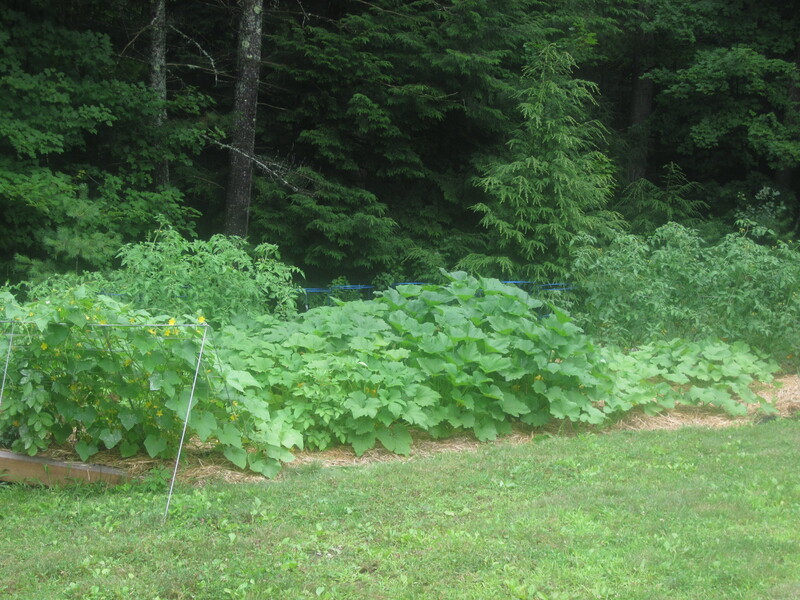 We have had a bumper crop of zucchini, summer squash and cucumbers. We have been getting a ton of cherry tomatoes and plenty of roma; I fear all of my beef steaks will all turn red at once. That will be another weekend of processing. I am not complaining I am actually very grateful we are having a great year. My favorite, for 20+ years, supermarket is on strike here on the East coast. Fortunately I was able to harvest some garlic this year, the bulbs are much smaller than I would like but there were around 70 of them; I had planted 120 bulbs in the fall but I will take whatever I can get considering the last two years I lost all of it. 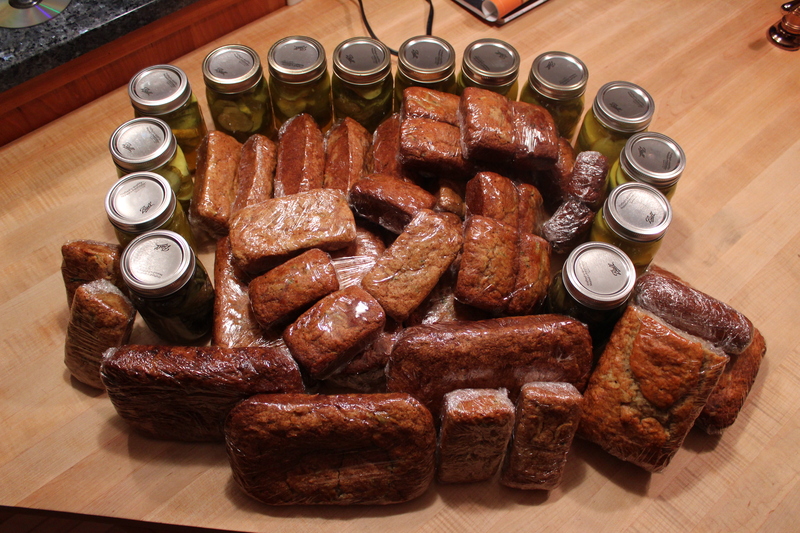 Today was pickling cucumbers and baking zucchini bread day. I pickled 8 jars of kosher dill and 34 loaves of various sized zucchini bread – I doubled the recipe below 3 times to get the 34 loaves. So far so good! I started blogging a little over a year ago; a few of you, since there were just few of you at the start; may remember me posting this zucchini bread recipe around the same time last year however SO many more people have come on board with me since. Technology is a pretty amazing tool. I was just looking at some of my blog stats and just today I had 3 people from 3 different countries check me out. Colombia, Brazil and Italy I find that SUPER cool. Also I had barely started my first paragraph tonight when my daughter faced time me from the Philippines; she is there vacationing with a friend of hers from Japan. The world is getting smaller and smaller. 2 cups shredded zucchini that you have squeezed out most of the liquid – I put it all in a colander, place a plate and something heavy on it in the fridge few a couple of hours. I still had to go to the store so it worked out great. In a stand mixer add the first 8 ingredients and mix well, add the flour till combined and then add the zucchini. Spray grease whatever you are using and fill to about ¾ full. Bake for about 40-50 minutes and let cool for a bit, remove from your dish and wrap or bag. These freeze really well. We literally just ate our last loaf from last year just the other day. If you are using a kitchen-aid with their 5 quart sized bowl you can double this recipe, however it will be very close to the top, so heed my instructions on when to add ingredients, it helps make sure all the ingredients get mixed well.